To quote a certain hmanga: "Little brown girls are the best "
Anyway, I just updated to Ubuntu 11.04 Natty. There has been a lot Whining about the new Unity interface. In my opinion it looks good and works pretty well, only thing I dont like is that it is less customizable than previous version that used Gnome 2. Eeeeh...whats with the " " ? Nothing with the really. I agree with the quote, especially if there are some nice tan lines to go along, there is just something about them that I like. Thanks, anything drawn by Misaki Kurehito will make your desktop look nice. Yours is as awsome as always, gotta love the Lucky Star dock. Ah I perfectly know what you mean, I also have this suntanline fetish you know . And thanks a lot, I also really the Lucky Sta dock, its at least better than the original winxp design. Edited by Clowd, 25 August 2011 - 10:44 AM. I love the irony in the picture, Yuno is deceptively cute. Just made this one today... ehh... already yesterday but oh well. yesI have stupid dutch windows. Edited by Nemingway, 02 May 2012 - 12:57 PM. Nothing like tight space suits . Im not really sure what dimension constitute as high res. Here is the original anyway. I hope its big enough. Interests:Anime and manga every now and then. Cars/driving, travel a bit as well. Okay here are my wallies from my laptop and Phone. dieselstation: Exotic car pictures and wallpapers - Fuel for your desktop. 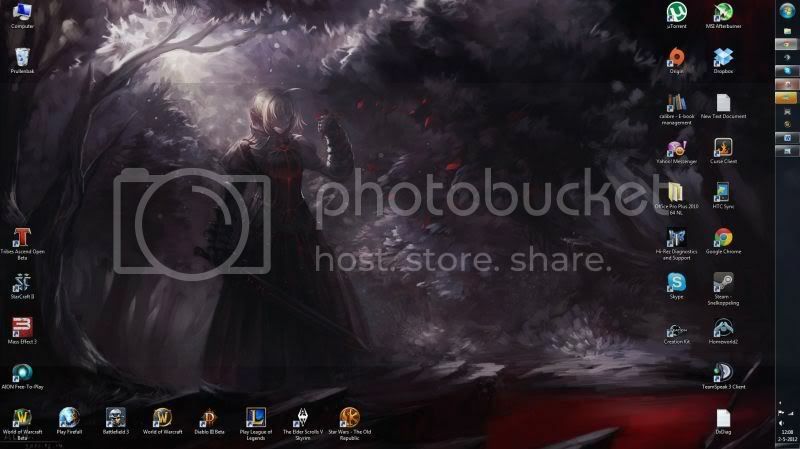 Lawl fate wallpaper, and so many great games, if i hadnt just cancelled my swtor and aion accounts just a few months back i would ask you for your igns xD. I just decided to delete all my games and stuff from my pc so i can make space for marathoning the stuff i missed from this and last season :S, that also gives me the chance to do a wipe of my hd once i finish. I'd say this is about half the damage my gaming and reading time (manga/ln) has incurred on my anime viewing time. Was filling the desktop until i realised i'd better stop and start again later once i finished those lol. As for wallpaper, i havent used a wallpaper since, probably 8 years, black background and theme looks cool and it helps my eyes when they hurt from staying up late (cursed sun).